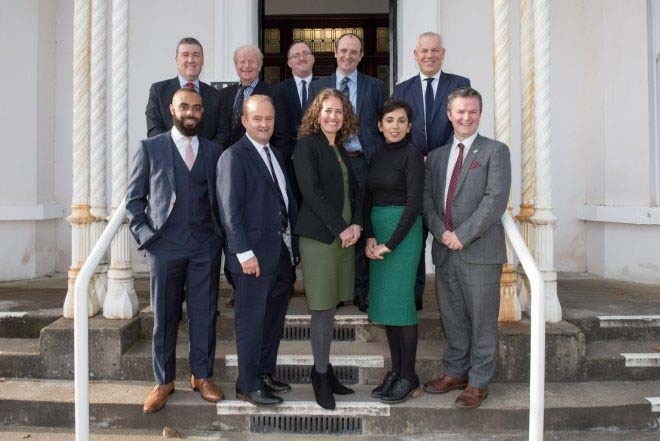 A high-level delegation of senior UK diplomats visited Londonderry in Feb as part of a two day visit to gain a wider understanding of the political structures, strengths, and unique offer of Northern Ireland. The visit was an opportunity to engage local interests and discuss how the Foreign and Commonwealth Office with other partners, is delivering support internationally for all parts of the UK, including Northern Ireland. During their visit, the group met with the Mayor of Derry City and Strabane District Council Councillor John Boyle and senior officers of council where they were given an overview of the council’s Strategic Inclusive Growth Plan and the work the council is doing to secure national growth in the city region. 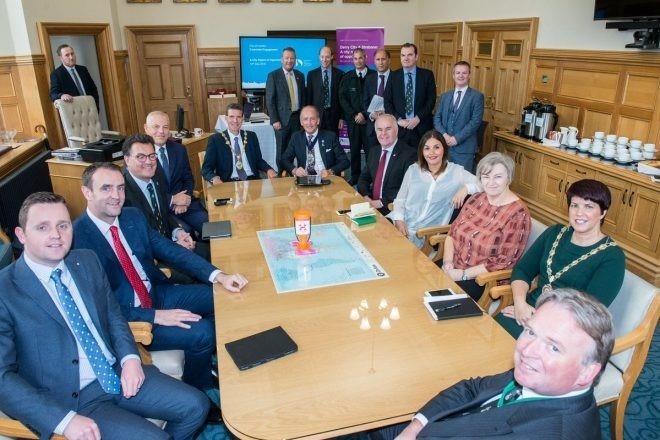 Mayor John Boyle said the meeting was very positive in identifying opportunities the Foreign and Commonwealth Office can help to represent the city and district’s interests abroad and to assist in helping the city region achieve its ambition. He said it was an excellent opportunity for the council and its stakeholders to engage directly with the Foreign and Commonwealth Office to discuss common interests in terms of business, trade and investment and education opportunities. The delegation also met with representatives from Invest NI before they travelled to Seagate Technology and the Ulster University. The delegation participated in a walking tour of the Historic City Walls before sampling a range of the finest local food and drink produce a food and drink tasting event at the Bishop’s Gate Hotel that was hosted by Invest NI, before an evening reception hosted by the Mayor. Speaking after the visit the Mayor extended his thanks to the delegation saying it was hugely significant in forging links with the FCO and in sharing information that will help the region with its current business and education challenges. The Guildhall underwent a dazzling makeover on Saturday as it was transformed from civic hub to catwalk spectacular as Fashion Fest made its fabulous return. The sell-out event was the fifth outing for the festival which has become the biggest showcase of fashion design in the North West, drawing a wide range of emerging and established names in the industry. The show was presented by Derry Girls favourite Dylan Llewellyn, otherwise fondly known as ‘the wee English fella’ who was lured to receive a warm Derry welcome. Members of the Derry Girl cast joined fashion fans in the audience, for an evening of glamour and catwalk fashion. The theme for this year was a nod to the hit Derry Girls series and the stage and choreography was set by Style Academy’s Tracey Hall. 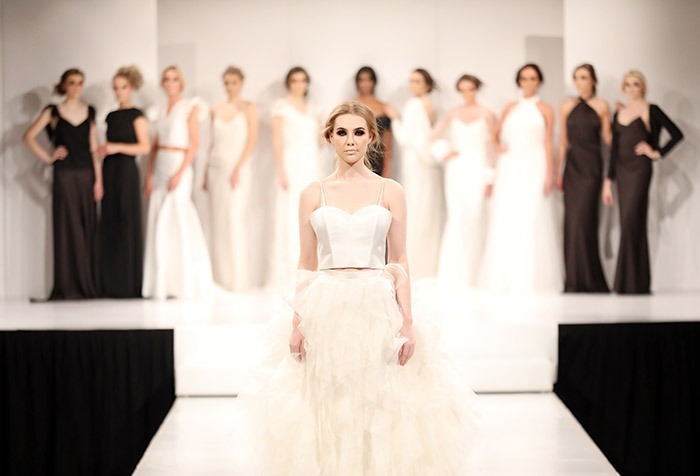 Leading the exciting array of designers who showcased their work on the night was stylist to the stars Kate Halfpenny, who showed pieces from her bridal collection as well as her stunning Black Edit Collection. Also attending the event was Rebecca Testi, the marketing executive of Italian international brand, Rebecca, one of the biggest internationally renowned jewellery brands. Speaking after the event, Business Engagement Officer with Derry City and Strabane District Council, Danielle McNally, said it had been a fantastic showcase of local talent. “I am delighted that Fashion Fest has been such a sell-out success. The dynamic range of local collections on display is a testament to the talent here in the North West and our growing profile as a fashion hub. The audience enjoyed an evening of live music, song and fabulous fashion from a whole host of emerging and established designers, including Bridie Mullan, Paul Stafford, Edel O’Kane and Luke Barber. Among the models who lit up the catwalk at the event was last year’s Face of Fashion Fest winner Oonagh Canning and with this year’s winner Lauren Burton, presenting the Mayors charity prize she will now embark on a year-long contract with Style Academy Model Agency. Performances on the night included music by Irish Singer/Songwriter Emma Wallace and Derry’s award winning DJ, Louise DaCosta. The Lord Mayor of the City of London extended an invitation to a number of schools in the Derry City and Strabane District Council area to travel to London in November to take part in his Business of Trust Celebration event at the Mansion House. The invitation comes following the visit in September to the city by the Lord Mayor of the City of London Alderman Charles Bowman and senior representatives from the City of London Corporation and the Honourable the Irish Society to attend a high level Londonderry City Region Economic Summit. During his visit to the City, Lord Mayor Bowman met with pupils from a number of schools to discuss the Business of Trust and ask for their recommendations for what businesses can do to increase their trustworthiness and help restore the public’s trust and confidence in the financial and professional services sector, and has since extended an invitation to nine pupils from Foyle College, St Mary’s College and St. Cecilia’s College, their teachers and a representative from Derry City and Strabane District Council’s Business team to attend his prestigious Business of Trust celebration event. The schools’ participation in the event is being facilitated by the Merchant Taylors Guild and the Honourable Irish Society. Edward Montgomery from the Honourable Irish Society has welcomed the inclusion of young people from the Council area in the event saying: “The Lord Mayor of the City of London was very impressed with the young people he met when he visited the city last month and was very keen to get them involved. 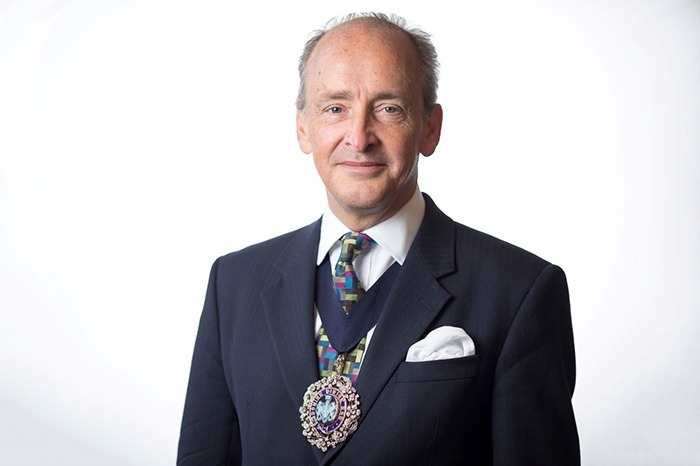 He said: “The Honourable Irish Society is delighted that the City of London Corporation has recognised our young people in this way and invited them to be part of this important Mayoral initiative. We are very supportive of our Council and our schools and businesses working in close collaboration with the City of London. We can learn a lot from each other and both benefit greatly from close collaborative working and linkages.” As part of the trip the schools will take a tour of the London Guildhall and get a presentation on the City of London Corporation. They will also get a tour of the BT hub, BT Tower and meet recent graduates and apprentices who have joined BT. Airporter invests £1m in new purpose built facility and hub as company expands. Derry-based transport firm, Airporter, has announced a £1 million investment in a new, purpose-built facility and hub as the company expands. The company’s new 14,000 sq. ft. hub on a 2.5 acre site, will regenerate the former headquarters of the old Lough Swilly Bus Company in Springtown Industrial Estate. The investment is the result of a six-month development plan, kick-started by a doubling of passengers over recent years. The hub includes on site servicing, fuelling and bus washing, with a range of new driver training and rest facilities, while Airporter’s current facility off Culmore Road will continue to be used for passenger pick-ups and drop offs. Founded in 1996, Airporter now runs 30 journeys a day to Belfast International and Belfast City Airport from the North West, carrying around 155,000 passengers per year. Since 2014, employee numbers have trebled, with 30 drivers and 15 buses on the road every day. The company has grown from just two drivers and two vehicles, carrying 5,000 passengers in its first year in business to a fleet of 21 vehicles. Previously, Airporter invested heavily in digital technology which allows passengers to book tickets 24 hours a day and bookings are now almost 100 per cent booked online. The announcement comes amidst a backdrop of concerns around the potential risks of Brexit and the lack of investment in infrastructure in the North West, but there has also been reason for optimism after work on the A6 between Dungiven and Derry began, which should see travel time reduced once complete. https://investderrystrabane.com/wp-content/uploads/2018/12/airporter.jpg 347 700 Ciaran McKane http://investderrystrabane.com/wp-content/uploads/2018/04/InvestDerry_Strabane_logo_small-003.jpg Ciaran McKane2018-12-10 11:54:502018-12-10 14:13:55Airporter invests £1m in new purpose built facility and hub as company expands. 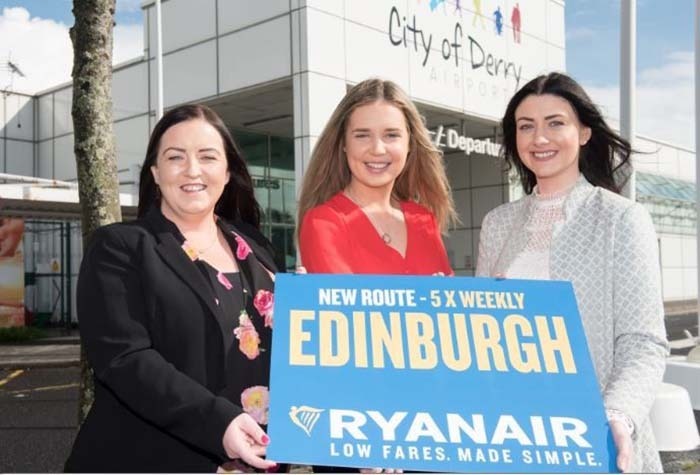 Ryanair, Europe’s No.1 airline, today launched its new City of Derry Airport route to Edinburgh in October by launching a £9.99 winter sale. The new route to Edinburgh commenced in October, with a five-time weekly service, as part of Ryanair’s winter 2018 schedule, which also includes a route to Liverpool. 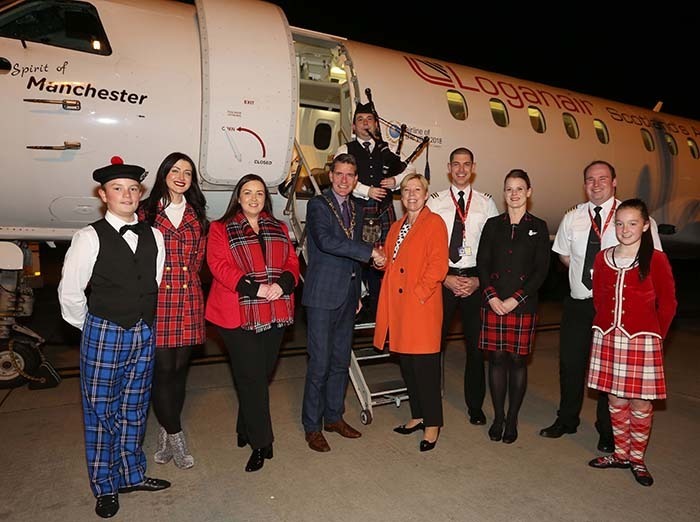 Loganair’s NEW City of Derry to Glasgow International service takes flight! Loganair’s new service between City of Derry Airport and Glasgow International is now underway, with the airline reporting strong sales from both business and leisure travellers. The new route, which operates five times a week between the two airports, has also acted as a catalyst for in-bound tourism to Derry-Londonderry and the region. Mayor of Derry and Strabane District Council, John Boyle, formally welcomed Loganair’s Commercial Director Kay Ryan to the airport after the arrival of the inaugural flight in March. https://investderrystrabane.com/wp-content/uploads/2018/12/loganair.jpg 522 700 Ciaran McKane http://investderrystrabane.com/wp-content/uploads/2018/04/InvestDerry_Strabane_logo_small-003.jpg Ciaran McKane2018-12-10 11:33:172019-04-18 13:48:51Loganair’s NEW City of Derry to Glasgow International service takes flight! On September 10th Derry City and Strabane District Council hosted a high level Derry~Londonderry City Region Economic Summit focusing on the work being done to develop business, education and investment links between Derry and London. The Derry~Londonderry City Region Economic Summit hosted by the Mayor of Derry City and Strabane District Council, Cllr John Boyle, and attended by the Lord Mayor of the City of London Alderman Charles Bowman along with senior representatives from the City of London Corporation and The Honourable Irish Society. The Summit took place at a number of venues across the city and involved stakeholders from the business, education, investment and industry sectors discussing the positive collaborative work being done with the City of London to promote Derry~Londonderry as a great place to do business. 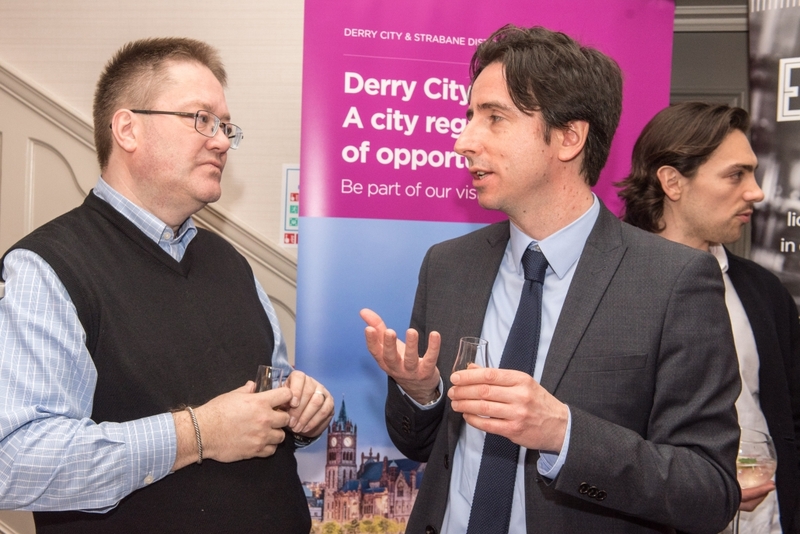 Organised by Derry City and Strabane District Council, the Derry~Londonderry City Region Economic Summit had been organised following a series of engagements and visits between the two cities over the past number of months. Mayor of Derry City and Strabane District Council Cllr John Boyle said purpose of the Economic Summit is to deliver the key objectives set out in the Strategic Growth Plan and the opportunities that exist to build and deepen regional engagement between the City of London and Derry City and Strabane District Council. He said: “Just last month I welcomed senior representatives from the City of London and The Honourable Irish Society where they received an update on the city’s bid for a City Deal and the work being done by the Council and its partners to further develop the existing strong links between Derry and the City London. Mayor Boyle added that the common synergy and connectivity between Derry~Londonderry and the City of London is huge significant. “The City of London is a global leader in areas such as the Financial Services sector. My hope is that recent investments such as that being made by Fintru and the creation of 305 new jobs is a shining example of the opportunities that exist in developing a sustainable relationship with the City of London. US investment delegation from the State of Pennsylvania visit Derry, Strabane and Inishowen. A high-level inward investment team from the State of Pennsylvania and the City of Philadelphia visited Derry, Strabane and Inishowen in October as part of a visit to Northern Ireland. During their visit to the North West the group met with the Mayor of Derry City and Strabane District Council John Boyle, and visited a number of local businesses, including E&I Engineering in Burnfoot. They also spent some time at the North West Regional College and the Ulster University Magee campuses to see at first hand the region’s entrepreneurship and innovation and skilled workforce. The delegation also attended a business engagement lunch with the Chamber of Commerce and met with international investors and local business representatives who are interested in doing business in the Pennsylvania and Philadelphia areas, as well as local companies such as Fleming Agri and Marblehill, who already export to the US. The visit was just weeks ahead of a forthcoming trade mission to Boston/Philadelphia, which will saw companies from Derry, Strabane and Donegal travelling to the US along with representatives from Derry City and Strabane District Council, Donegal County Council, the Local Enterprise Office, North West Regional College and LYIT. Among the representatives who visited the city this week from the State of Pennsylvania and the City of Philadelphia were Mr David Briel (Executive Director, Centre for Direct Investment, Pennsylvania); Mr Richard Kilner (Office of International Business Development, Center for Direct Investment, Pennsylvania); Mrs Sylvie Gallier Howard (First Deputy Commerce Director, Department of Commerce, City of Philadelphia) and Mr Vaughn Ross (Deputy Chief of Staff to the Mayor of Philadelphia). Mayor Boyle said: “They were very impressed with our offering and how well placed we are in terms of offering cost competitive business opportunities along with high level digital connectivity and a young and well educated workforce. https://investderrystrabane.com/wp-content/uploads/2018/12/1.jpg 441 660 Ciaran McKane http://investderrystrabane.com/wp-content/uploads/2018/04/InvestDerry_Strabane_logo_small-003.jpg Ciaran McKane2018-12-07 15:31:142018-12-10 14:04:37US investment delegation from the State of Pennsylvania visit Derry, Strabane and Inishowen. 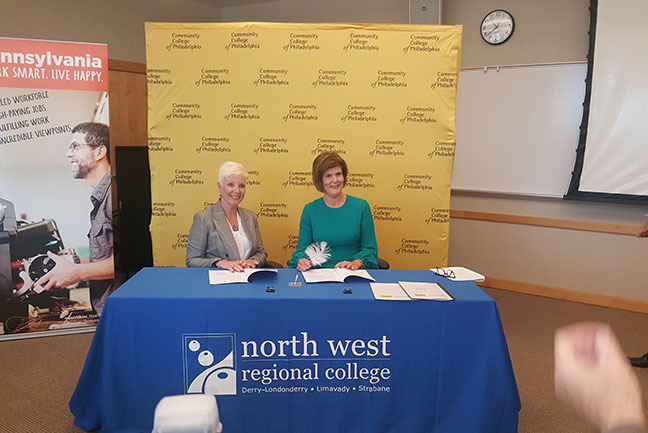 North West Regional College (NWRC) has signed two Memorandums of Understanding in the United States, signalling its commitment to international co-operation with other education partners. Samantha Traynor, Vice Principal of North West Regional College has travelled to Philadelphia with the College’s European Projects Officer Bronagh Fikri, to sign a MoU with the Pennsylvania Department of Community and Economic Development and the Community College of Philadelphia. Mrs Traynor was part of a high level trade and investment delegation to Boston and Philadelphia lead by Mayor of Derry City and Strabane District Council John Boyle, and Seamus O’Domhnaill, Cathaoirleach of Donegal County Council. The visit was part of the ongoing positive work being done by the two Councils to establish strong economic development links and initiatives in the US and will build on the work done over the last number of years in promoting the North West region as an attractive investment proposition and on developing new market and network opportunities for businesses from Donegal, Derry and Strabane areas. A number of companies from the North West are involved in the trip, as well as third level and further education providers and development organisations from across the North West including Ulster University, Letterkenny Institute of Technology, North West Regional College and Udaras na Gaeltachta. Speaking at the signing of the MoU Mrs Traynor said: “The signing of this MoU in an important event for our College, it’s a great day and one that sees us formalise our educational partnerships, that we have been building and consolidating over the last two years with the wider Penn State through the Department of Community and Economic Development and also with the Community College of Philadelphia. “The MoU represents the first step in building and consolidating a partnership through education and training with a specific focus on sharing best practice in Work Based Learning to include Traineeships, Apprenticeships including Higher Level Apprenticeships and also the continued professional development of our respective professionals in our workforce.